CWB Chicago: SUNDAY TICKER: Morning In The "Entertainment District"
SUNDAY TICKER: Morning In The "Entertainment District"
1:51AM - CTA calls in a fight, street level at Addison Red Line. 2:13AM - Clark Street police detail witnesses a "big fight" inside Dimo's pizza, 3463 N. Clark. 2:32AM - Fight in front of Red Ivy. 3:12AM - Officers request an ambulance at 3525 N. Clark for a 30-year-old male with "a boatload of blood coming from his right eye." 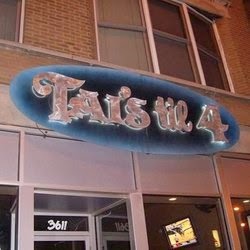 Tai's til 12 or 12:30 might be a better idea. 3:31AM - In a nearby part of Lakeview, a 25-year-old man was shot in the eye as he stood outside of Tai's Lounge, 3611 N. Ashland. Officers found 12 shell casings in the driveway of a nearby gas station. The victim was taken to Illinois Masonic Medical Center. Most of the witness were intoxicated and descriptions of the getaway car ranged from a black SUV heading north to a white SUV heading south to possibly two silver vehicles. A police source tells us that the victim is not in a gang, however the shooter is suspected to be a Latin Eagle. No one was in custody this morning. Gang members had gathered in the area earlier in the night for a memorial service at the intersection. It is believed that members of a rival gang came along, shots were fired, and the victim was hit by a stray round. Recorded as an aggravated battery with a firearm in CPD case HX257063. 4:42AM - Large group of people fighting at Halsted and Aldine. One participant has a Tazer. An officer at the Belmont Red Line station states that a passing cab driver confirmed the 911 caller's report. 5:32AM - A woman is beaten on Belmont between Seminary and Kenmore by an unknown offender. The victim tells officers that she was talking to two white males when one of them suddenly began punching her. The 19th district was in a RAP, meaning that no police officers were available at the time, so the woman waited for an extended period of time for help to arrive. The two men were last seen running through a nearby alley.